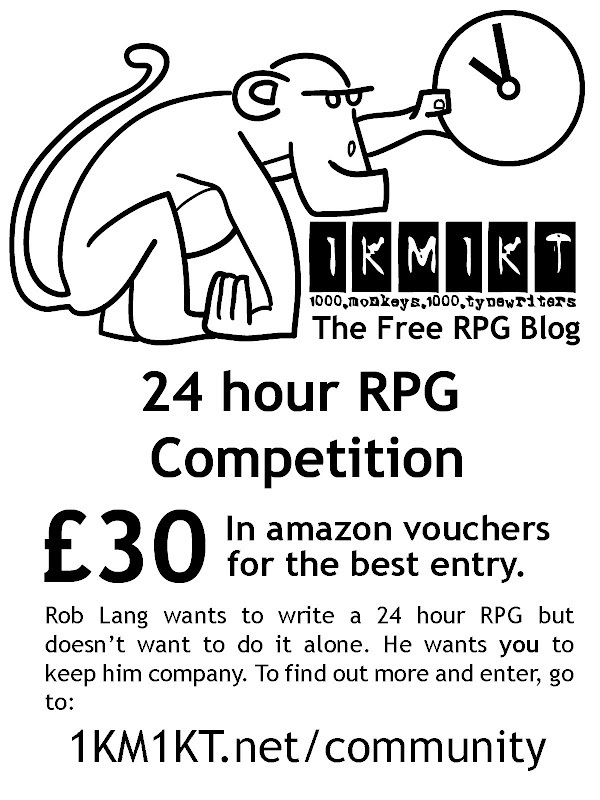 The Free RPG Blog: 24 hour RPG Competition - Win Amazon vouchers! Dust off those brain cobwebs and write an RPG in 24 hours and give it over to the world. If you manage to stick to our rather bizarre set of rules you could be in the running for £30. Yes, that's thirty of your Great British Pounds in tasty Amazon vouchers! Spend 24 hours writing a roleplaying game on that topic. Make sure you include an NPC called Keeton (the glorious benefactor of 1KM1KT) in your game. Upload your game to 1KM1KT by 00:00 (GMT) 1st July 2009. 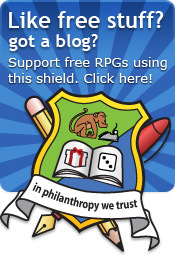 Check back on Friday 17th of July 2009 to find out who the winner is, or check on The Free RPG Blog. That's it? Easier than herding cats. More interesting than philately. Better than the horizontal mambo. Well, nearly. Well, that very neighbourly of you. A link here or to 1KM1KT would be lovely, or you might like to consider one of these lovely advertising nuggets. Will you be actually be making one? Yes. It might well near kill me but I'll be making one. I won't be entering it in the competition to win the Amazon vouchers because, well, that would be bloody stupid. I'll let you know of the weekend I'm doing it and then Tweet as I go. When it says 24 hours, does it mean an actual 24 hours of work, or just one 24 hour day (that is, 16 hours of work and 8 of sleep)? Maeglin, it's a 24 hour period. So, if you sleep, then you lose that time. There are lots of brave people who have explained their process on 1KM1KT Community.